2018 is already off to a strong start for RPGs, both Western and Japanese alike. Fans of both will find something to love. Here are the five best RPGs released in Q1 2018. All of these games are ready to be played by you, so get on out there and adventure through new worlds. Oh, you knew we had to include this one in our list of the best RPGs of Q1 2018. Monster Hunter: World is the game that took the world by storm, catapulting to become Capcom’s best-selling game of all time in only a matter of weeks. The core of World is the same Monster Hunter we’ve known for years, but it updates the series in some meaningful ways, making it far more accessible to new players. The crux of this game has you traveling to the New World, searching for an answer to why the Elder Dragons are all migrating. Once there you’ll take on a whole slew of hunts and quests, tracking down new and dangerous beasts, as well as some series classics. All 14 of the weapons featured in MH4U make a return, and World has a quick matchmaking system that lets you easily jump into other player’s games, and vice versa. World ditches the zone-based structure of previous MH games, opting instead for six expansive open world areas. The new Scout Flies mechanic makes it much easier to track certain beasts in the world, and find your next objective. The upgraded technology works wonders for World, making everything seamless and giving combat a great flow. A handful of other small changes, like being able to use a potion while running, helps make the game even more streamlined. There’s still a generous learning curve to Monster Hunter: World, and it’s a game you’ll need to invest time in. However, it’s easily the tightest and best MH yet, and there’s always a fellow hunter willing to lend a helping hand if you need it. 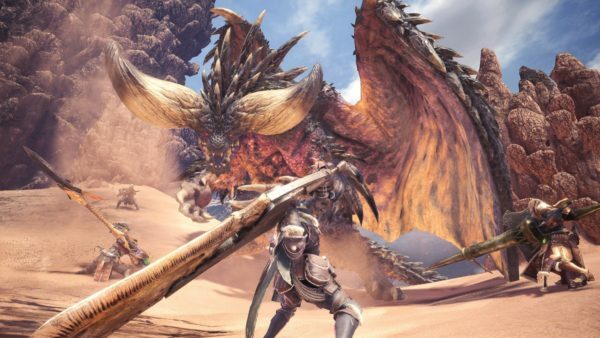 With universal acclaim from both fans and critics, MH:W will absolutely be one of the biggest games of 2018.